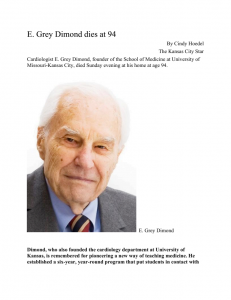 Dr. E. Grey Dimond, founder of the University of Missouri-Kansas City (UMKC) School of Medicine passed away November 3, 2013. His life was devoted to the practice of medicine, to medical education and, for the latter half of his life, to promoting friendship between his country and China. He was a very early president, 1961-1962, of the American College of Cardiology and, at his death, the oldest surviving president. During his military service in Japan, Dimond was sent to Shanghai to examine Americans who had been imprisoned there by the Japanese. From that experience, he made himself knowledgeable about China. In 1971, his friend, journalist Edgar Snow, arranged for Dimond and his teacher, Paul Dudley White, to visit China. The two men were the first American physicians in China in twenty-two years. Dimond made the re-establishment of friendly relations between the two countries a prime duty. In his life, he made forty trips to Asia, hosted numerous American groups on visits to China, brought many students from China to UMKC, and, capping all this, he and his wife adopted a Chinese daughter in 1980. Dr. Dimond's father was from a prominent Mississippi family. The couple was visiting and Christmas shopping in St. Louis, his mother's home city, when she went into labor. Grey was born on his mother's birthday, December 8, 1918, and the family returned to Terre Haute, Indiana five days after his birth. During testimony in Jefferson City, Missouri, attempting to get funding for the new medical school, one of the legislators challenged Dimond as to why a Mississippi native was asking for Missouri money. The reply: "I was born in St. Louis and my mother's family came to Missouri in 1815, before it became a State. When did your family come?" The legislator choked, then recovered with a laugh, and said, 'You win! My father came here from Italy!' Dimond did not volunteer that he had lived in St. Louis only the first five days of his life. As a youth, Dimond enjoyed sports, lettered in high school in football and track and, at Purdue, competed in football and boxing. His medical degree in 1944 was from Indiana University. His post-graduate training was at Indiana Medical Center and Massachusetts General Hospital. He was in the Army medical corps and was Chief of Cardiology for the 42nd and 49th General Hospital, Tokyo. For ten years he was head of the heart department and, later, of the Department of Medicine, University of Kansas Medical Center. He became founder and head of the Institute for CardioPulmonary Diseases at the Scripps Clinic, La Jolla, California, then was consultant in medical education to the Department of Health, Education and Welfare in Washington before returning to Kansas City to found the UMKC School of Medicine. He and his wife, Mary Clark Dimond, built a home on Hospital Hill in Kansas City, later expanding Diastole into a scholars' center for UMKC and leaving it endowed to a private foundation in order to enhance the efforts of the University. Dimond wrote sixteen books, including detailed summaries of his ancestors: the Dimonds, the Whiteheads, the Morrisons, the Schmidts. His daughters, Sherri Grey Byrer, Lark Grey Dimond, Lea Grey Dimond, and Joan Tung Wu, MD, three grandchildren, eight great-grand- children, and six great-great- grandchildren survive him. 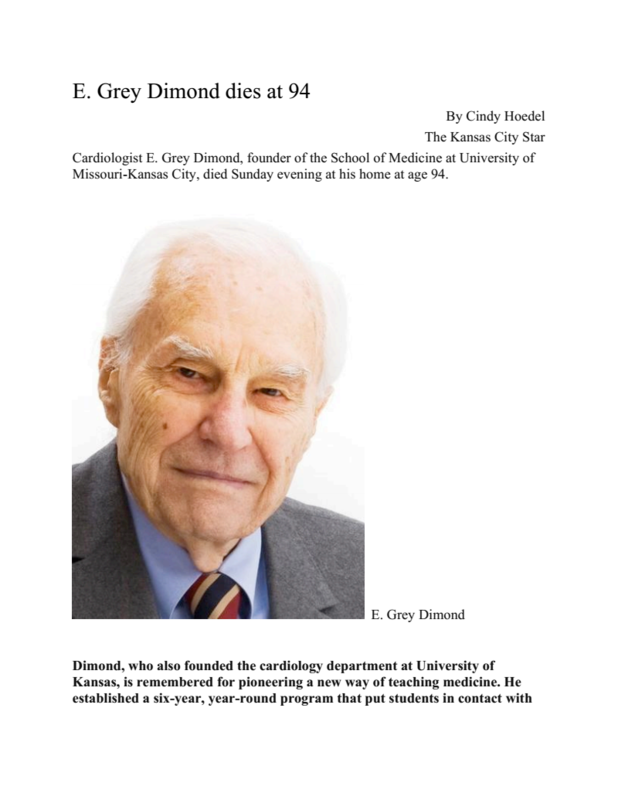 A memorial is to be held in Kansas City, on the campus of UMKC, on December 8 in celebration of the shared birthdays of Dr. Dimond and his mother. His ashes will be placed at the family cemetery in Winona, Mississippi. At the family's request, memorial contributions may be made to the E. Grey Dimond Memorial Fund c/o Diastole, 2501 Homes Street, Kansas City, Missouri 64108.